Today was all about the walk and the mind game. I decided last night that I would do the last 15 miles to Panther Creek Campground, given that I’d done 9+ and 12+ the last two days. The first 4 were back up over another ridge, with 3 L because there was no reliable water until Trout Creek at 2174, or 9 miles. So a decent 4 mi up, a steeper 3 mi down, and then 6 mi of flattish. I was pretty damned tired, and my legs, hip, and feet were talking to me. Still looking for the sweet spot. Looking up Trout Creek, 2174, after another long dry spell. About halfway through a fifteen mile day. This section of the trail meanders through a variety of land ownership. After Trout Creek, there is a road walk, a meander through a tall grass field, a skirt of private property on both sides, and so forth. My feet and hip were pretty much done, so I was glad that it was pretty flat. 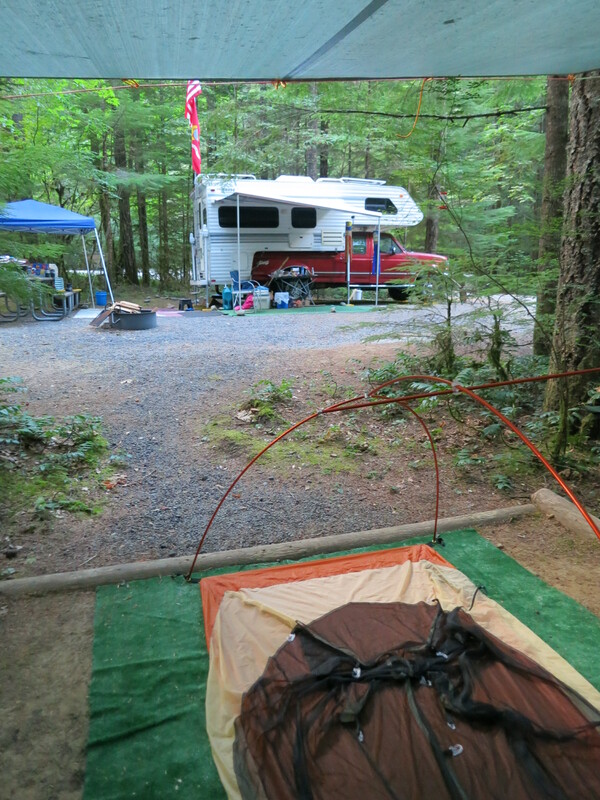 Finally, I reached Panther Creek Campground, at 2179. The last six miles of trail before Panther Creek Campground. It was mostly flat, and there were a variety of landowners. Finally! My best mileage to date, at 15. First stop was to see the campground host. Rumor had it that Panther Creek had tent spaces reserved for PCT hikers. This was not exactly the case. If it had been midweek, there would have been sites available, but this was Saturday. Larry, the host, said there were none, but he invited me to use the tent pad on his site. Woohoo! Flat astroturf, under a shelter. There are vault toilets, and water is available via hand pump. Almost the Ritz. Larry shared his bounty with me: pre-pumped water for drinking and a quick bandanna bath, a table for making/ eating my dinner, and boiling dinner water from his trailer. And he gave me my first Trail Magic: an ice cream bar! Good merciful heavens, that tasted great. Easy night after a long day. The campground host shared his tent pad, potable water, stove, and ice cream bars!